It looks quite strange seeing the words West, Bromwich and Albion after his name in brackets and I’m sure it will be to Chaplow but after completing his move he is now officially a Baggie and as far as the Clarets are concerned he is back to being a fan. 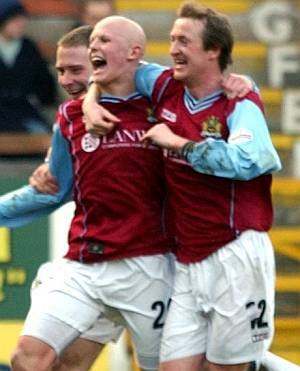 I’ve been checking back to try and recall when I first saw him play in a Claret & Blue shirt, it was certainly at Gawthorpe and was, I think, sometime in 2000. He was noticeable for the fact that he was not the biggest player on view and I think he turned up in his school uniform. I don’t think he particularly impressed me that day but he soon did and it was certainly no surprise when we offered him a scholarship in the summer of 2001 when he joined the club along with other hopeful youngsters including two more local lads in <?xml:namespace prefix = st1 ns = "urn:schemas-microsoft-com:office:smarttags" />Robert Grimes and Paul Scott and three Jack Hickson recommendations from the north east in Sean Blakey, Mark Rasmussen and Steven Richardson. He made his reserve team debut away from home against Wolves as a late substitute and was soon catching the eye of spectators at Gawthorpe in the youth team games if not always impressing coach Terry Pashley who would forever be berating him. There was never a suggestion from the Gawthorpe regulars that we might have another Trevor Steven on our hands but he certainly got the vote as the most likely to come through from a very ordinary looking youth team. The first season had gone well even if at times it wasn’t spectacular – but a couple of changes of hair colour certainly made him noticeable on the quiet days. I think it is fair to say that the second season had its highs and lows – this was an important season for him, he needed to impress to win himself a third year on his scholarship and that looked far from a certainty with coach Pashley seemingly less than impressed with him. He started the season well enough, generally vying for a midfield role alongside such as Blakey and Richardson. For many of us he was starting to stand out (and this had nothing to do with the latest trend, red streaks in the hair). Did I say it was to be a season of highs and lows? It certainly was and the lows came first, one big low when he was taken ill with glandular fever. It ruled him out for some time with suggestions that his season could well be at an end. His all future could now have been hit by the illness. Incredibly, he was back by January and lined up for the youth team at Gawthorpe on a miserable damp, wet and windy Monday afternoon as we took a hammering from Stockport. He looked rusty, he looked off the pace, and looked to have lost what bit of strength he had but he was back in action. The next three months saw him getting better as the first team were off on a cup run that would see them reach the last eight before going out at Watford. Chappy’s determination and the aftermath of the cup defeat were to stand him in good stead. By the time the first team had decided enough was enough for the season and began turning in some dreadful performances it was all getting better and better for Richard Chaplow who by now was almost back to his best. I had a conversation with Stan Ternent at that time about the youth players. Stan said he had been accused of not giving them a chance so who would I put in the first team. I gave him my opinion, I’m sure he took as much notice of me as he had done in the past, but the name I put forward ahead of all others was that of Chaplow. 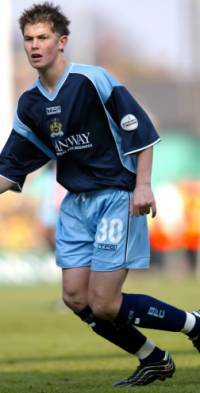 It was Matt O’Neill who was first to get a chance, he came on as a substitute in the 7-4 home defeat against Watford. A week later, and alongside his old school friends O’Neill and Joel Pilkington, he was named as a substitute at Norwich. Just after half time he got the nod from Stan, he was to come on for Gordon Armstrong who had himself come on as a substitute early in the game. His appearance on the touchline brought some interest from the knowledgeable Burnley fans at Carrow Road. “Who’s this?” said one. “Never heard of him,” said another. “Where does he play?” was another question. Obviously not fans who had given the reserves a second glance during the season. Two supporters sat directly behind me looked very agitated as Richard prepared to come on for his Burnley debut. They seemed to be very nervous so I decided to enquire. “Are you OK?” I asked politely. “No, I’m shitting it,” replied Mr. Chaplow. It was Richard’s dad, along with his mum. It is hard to imagine just how a Burnley supporter of some forty years can possibly feel when he sees his son preparing to make his debut. Around fifteen minutes later, still concerned with the welfare of those Clarets sat behind me I turned to point out that he was doing well enough, and he was. At the time I thought it might just be a one off performance but that was certainly not the case, Chappy was in the first team squad and was to remain there right up until this week. If there had been any doubts whether he would get that third year scholarship then they were ended, it was guaranteed. He made two more substitute appearances before getting a start on Easter Monday at Nottingham Forest where he came so close to getting his first Burnley goal and played once more against Sheffield Wednesday but the less we say about that particular game the better. What we didn’t know at the time was that Richard was already having further medical problems that would become all too apparent at the start of the following season. When he returned for pre-season training there were no streaks in the hair, no new style, there was just no hair at all. “What’s he done with it now?” I thought when I saw this bald headed youngster training at Gawthorpe. He’d done nothing, he’d lost his hair with alopecia brought on by the early return to action following the glandular fever. He was certainly noticeable and was in the starting line up for the start of the season. He was poor and left out but was quickly back to score his first goal against Crewe where the television cameras picked him up celebrating with a shout of ….. we’ll leave that to your imagination. Stan had wanted to use him sparingly in what was his first full season but that became impossible due to the small squad. And in any case he was becoming one of the stars of the show and was adding some quality goals with those against Reading and Ipswich coming to mind. It wasn’t all perfect though and he fell foul of referee Prosser in the FA Cup tie at Mansfield and found himself the third player sent off for kicking the ball away. That memory soon faded when he was called up to play for his country. 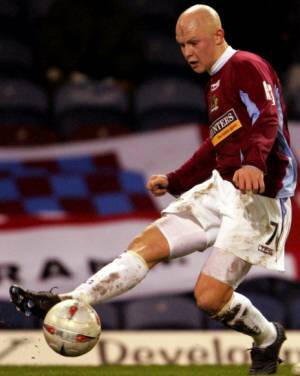 Originally selected for the Under-19s he was later moved into the Under-21 squad and became Burnley’s first ever England Under-21 international when he came on as a substitute. He won himself a full contract, he got a further international cap with the Under-19s and everything looked just about perfect – hair or no hair. The summer brought about speculation that he might be on his way to Leeds but new manager Steve Cotterill gave him the captain’s arm band for the first friendly at Accrington and then tied him up to a four year deal. His good form continued and then came a fantastic moment for him and for all of us with a real interest in Burnley Football Club. In and England Under-20 international at Huddersfield he came on and scored the only goal of the game against Holland. He became the first Claret to score for England since Andy Kilner had done for the youths over twenty years earlier. An injury in the Carling Cup win over Aston Villa kept him out of the side for a while and once he had got himself back and on the bench some daft rumours of a move to West Brom were doing the rounds. They wouldn’t go away but no one who saw his performance against Liverpool recently would have believed he could be on his way. By the next round, and a disappointing show, it was looking inevitable and two days ago he left the club he has supported all his life to join the Baggies. He’s a Claret and always will be. He might not remember too much about it but he was at Wembley for the Sherpa Van Trophy Final in 1988 and again when we beat Stockport there six years later. There’s no doubt he’ll always look for our results, he’s one of us. Our role now is to wish him happy birthday today and to wish him well for the rest of his career and thank him for the last couple of years. This weekend he could make his Premiership debut at the same ground as he made his debut – and his hair is coming back as well.